FN FS2000 COMPLETE CALIFORNIA CONVERSION KIT. THE FN FS2000 KIT COMES COMPLETE WITH A BULLET BUTTON® & BARREL EXTENSION. THE BULLET BUTTON® IS MADE OF A BLACK POLYURETHANE. THE BARREL EXTENSION IS TO MAKE THE BARREL/GUN LENGTH TO CALIFORNIA REQUIREMENTS. IT IS MADE FROM 6061 ALUMINUM AND ANODIZED BLACK. FN PS90 COMPLETE CALIFORNIA CONVERSION KIT. THE FN PS90 KIT COMES COMPLETE WITH A BULLET BUTTON® & BARREL EXTENSION. THE BULLET BUTTON® RELEASE MECHANISM IS MADE OF 6061 BILLET ALUMINUM AND THE BULLET BUTTON COVER IS MADE OF CARBON STEEL. 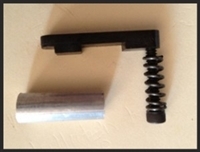 THE BARREL EXTENSION IS TO MAKE THE BARREL/GUN LENGTH TO CALIFORNIA REQUIREMENTS. IT IS MADE FROM 6061 ALUMINUM AND ANODIZED BLACK. FN SCAR COMPLETE CALIFORNIA CONVERSION KIT W/ BULLET BUTTON® AND STOCK STOPPER. THE FN SCAR BULLET BUTTON® IS MADE OF HIGH GRADE STEEL AND FINISHED WITH BLACK OXIDE. KEL TEC RFB COMPLETE CALIFORNIA CONVERSION KIT. THE BULLET BUTTON® MACHINED OF 6061 BILLET ALUMINUM AND ANODIZED BLACK. THE MUZZLE BREAK IS CARBON STEEL AND BLACK WITH A BLACK OXIDE FINISH. SIG SAUER MCX / Lancer COMPLETE CA CONVERSION KIT. COMES WITH SIG SAUER MCX / Lancer BULLET BUTTON® AND MCX / Lancer STOCK STOPPER. SIG SAUER MPX COMPLETE CA CONVERSION KIT. COMES WITH BULLET BUTTON® AND STOCK STOPPER.